Due to popular demand, the Deluxe Box Set will now be available December 14th, 2018. You can now watch clipping.’s new lyric video for “Stab Him in the Throat” directed by Mortis Studio. The song is found on the Rick and Morty soundtrack, and is inspired by the show. 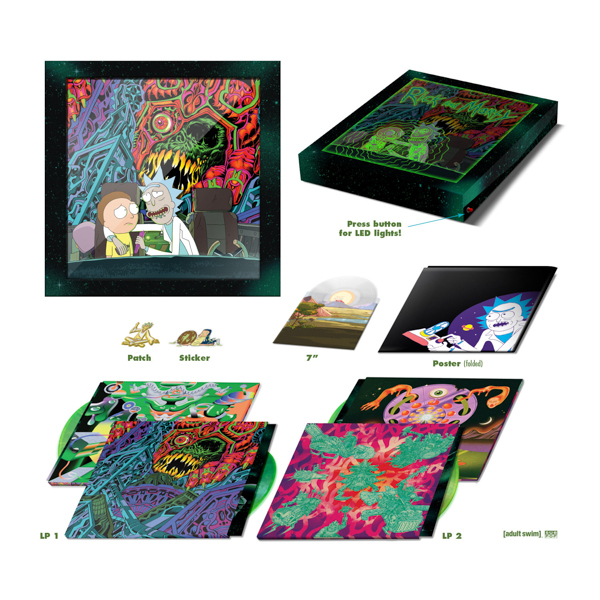 Due to overwhelming popularity, the release date for the Deluxe Box Set version of the Rick And Morty soundtrack has been moved to December 14th in order to meet demand. For those customers who have waited patiently for their pre-orders, we will be shipping orders on a first come, first served basis as soon as these sets become available. The Deluxe Box Set includes the album on double-LP pressed on an exclusive “Portal” colored vinyl* along with a custom poster, a patch, a sticker, and a bonus 7” single (featuring an extended mix of the screaming sun from the 2nd season finale, pressed on clear vinyl). All of this comes housed in an attractive, borderline extravagant box featuring a plexiglass window cover which reveals a glowing design when lit by its integrated LED lights. A traditional cassette tape of Rick and Morty soundtrack will also be available this Friday, November 23rd, 2018. Rick and Morty follows a sociopathic genius scientist who drags his inherently timid grandson on insanely dangerous adventures across the universe. Rick Sanchez is living with his daughter Beth’s family and constantly bringing her, his son-in-law Jerry, granddaughter Summer, and grandson Morty into intergalactic escapades. Can the family survive Rick’s insanity and all the chaos the universe throws at them? Rick and Morty stars Justin Roiland, Sarah Chalke, Chris Parnell and Spencer Grammer. The series is created by Dan Harmon and Roiland who also serve as executive producers. Newer Entry: Sub Pop Signs Perfect Son To Release 'Cast,' His Debut Album Out February 15th, 2019. Now Listen To Lead Single "It's For Life"